Made from organic grapes from our own Estate vineyards located in Gualtallary, Tupungato (Uco Valley) at an altitude of 1200 meters (4000 feet) above sea level, one of the highest points in Mendoza. 100 % Malbec, late harvested, when grapes are dry, long pre and post maceration and fermentation. Then aged in French and American second use oak for 12 months and at least 8 months’ bottle ageing.It is an opaque violet wine, almost black color with big intensity and bright notes. In the nose it has intense rich aromas with blackberry fruit, blackcurrant, chocolate and coffee notes. 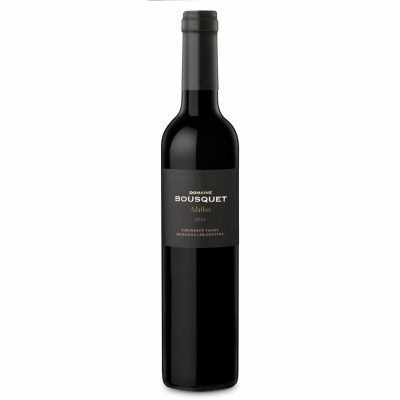 In mouth it presents ripe plum flavor, notes of marmalade and chocolate, moderate sweet, follow through to a full-bodied palate, with silky tannins and a long finish. Very concentrated aromas with finesse texture thanks to the good balance of natural sugar and acidity. This wine is ideal with desserts, chocolate and cheeses.